Why is PETA dredging up the monkey selfie controversy? If an animal takes a picture of itself with your camera, can you copyright that image? That is the basic question that has been given new life by People for the Ethical Treatment of Animals (PETA). This week the animal rights group filed a lawsuit seeking to get permission to have Naruto, an Indonesian macaque monkey, declared the “author” and owner of a photograph he took using British nature photographer David Slater's camera in 2011. So why is PETA revisiting this decision? Slater recently self-published a book called "Wildlife Personalities" that includes the popular selfie photos. PETA wants to administer any proceeds from the monkey selfie "for the benefit of Naruto and his community, without compensation to PETA." PETA is arguing that even though the photos were taken in Indonesia, since Slater's book is published in California, a U.S. federal court should have jurisdiction. The plaintiff in the lawsuit is listed as “Naruto, a Crested Macaque, by and through his Next Friends,” including PETA and Dr. Antje Engelhardt, a primate researcher from Germany who's studied macaques. "Our argument is simple: U.S. copyright law doesn’t prohibit an animal from owning a copyright, and since Naruto took the photo, he owns the copyright, as any human would," says the group. …it will be the first time that a nonhuman animal is declared the owner of property…Rather than being declared a piece of property himself or herself. This case exemplifies what PETA has championed for 35 years: Animals deserve recognition of appropriate rights for their own sake, and not in relation to their exploitation by humans. While some consider this entire lawsuit to reek of exploitation by humans, the case also stands on very flimsy legal ground, according to CNN legal analyst Danny Cevallos, who said on CNN.com that in order for something to qualify for copyright protection in the United States it must: be fixed in a tangible medium, be original, and have an "author," which in the U.S. is a qualification reserved for human beings. "Materials produced solely by nature, by plants or by animals are not copyright-able," he said. And what does the being who owns the camera that was used by the monkey to take the selfie think of all this. On his Facebook page, Slater summed the lawsuit up as, "greedy PETA wishing to exploit the selfie for their own agenda." "PETA, an animal charity I have worked with in the past to protecting Wild Boar in the UK, are showing themselves to be more interested in themselves, selfie style, than the plight of animals in trouble," he writes. Slater explains that in the lawsuit, PETA uses quotes from Slater's book to try and show that Naruto created the selfies. Indeed, the lawsuit quotes a number of excerpts from Slater's book in building the case that Naruto "understood the cause-and-effect relationship between pressing the shutter release, the noise of the shutter, and the change to his reflection in the camera lens." Slater calls this "entertaining but sad" and states that if PETA had contacted him directly he would have supported "them in efforts to get animals recognized legally with an aim to promote animal dignity." The Animal Legal Defense Fund and the Animal Welfare Institute declined to comment for this article. In the meantime, the selfies remain on Wikipedia, which has refused to take them down at Slater’s request. And that’s why they can be used in this post as part of the public domain. 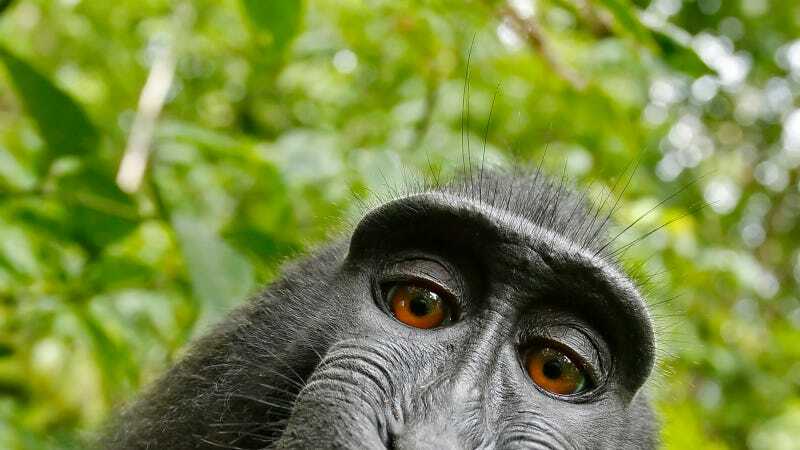 Self-portrait of a female Celebes crested macaque (Macaca nigra) in North Sulawesi, Indonesia, who had picked up photographer David Slater's camera and photographed herself with it.